Which Swagman Bike Rack Do You Need? Home » Bike Accessories » Which Swagman Bike Rack Do You Need? Whether you’re looking for a way to go mountain biking or take children’s bicycles on vacation, you will need a bike rack for your vehicle. Bike racks are available for hauling bicycles on many types of vehicles. Here is some information to help you choose the best Swagman bike rack for your needs. There are several options for mounting bike racks on vehicles. Some racks are designed for specific types of vehicles, while others are designed to go on certain places on a vehicle. Some designs include racks made specifically for RVs and pickups, as well as cars. There are also racks made to be mounted on the roof of a car, the trunk, or mounted to the hitch of a vehicle. 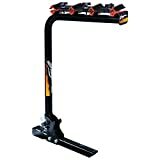 Many people choose to use roof mounted bike racks to prevent obstructing the view from the rearview mirror when taking their bicycles with them on a trip. There are two types of roof-mounted racks to choose from: fork mounted, and front mounted racks. The main disadvantage of roof racks is that the bike needs to be lifted onto the roof of a vehicle, which could be difficult to do for shorter people or someone without upper body strength. When transporting a bicycle using a fork mounted rack, the front wheel of the bike is removed before securing the bike to the rack. The height of the bike is reduced, and it provides more security and stability for your bike. The main drawbacks of a fork mounted rack are that not all bicycles are compatible with them and the front wheel needs to go into the vehicle or on a separate wheel holder. A front mounted rack secures a bicycle on the top of a car by securing the front wheel within the frame or with a piece that attaches to the fork crown. 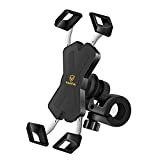 This bike mount fits almost any bicycle that has 20” to 29” tires. Front mounted racks may not be compatible with bikes that have unusual frame styles or full-suspensions. 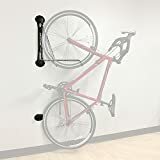 The height of the bike will be higher on this type of rack, so you will need to be careful while entering garages, going under tree branches, or other low-hanging obstacles. Before adding a roof bike rack to your vehicle, a base roof rack will be needed to mount a rack properly. Base roof racks may be factory installed on some vehicles, but if you don’t have one, you can buy one and install it. Most racks installed on cars are removable so you can exchange them with ski, surfboard, or cargo racks as needed. If you own a pickup, then you may be tempted to lay your bike in its bed when transporting it. 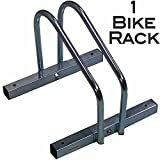 However, to secure and protect your bikes, you should buy a pickup bike rack. Like roof-mounted racks, you can purchase fork or upright bike racks for your truck. With an upright rack, there is no need to remove wheels from the bike to secure it. Many truck bed racks allow you to haul one to four bicycles to prevent damaging them. A wheel is placed in one of the spaces on the rack and then secured. Many models have locks for safeguarding your bikes when you’re making stops. A fork mount truck rack requires the removal of the front wheel to hold bikes in place. They can hold up to four bicycles in the bed of most pickups. Most truck bed bike racks will fit most standard or compact pickup beds. 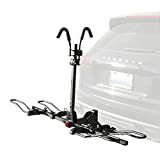 If you own an SUV, pickup or a car with a hitch, then a hitch mount bike rack can be the best way to travel with a bicycle. They are available in several models to fit most vehicles and can carry one to four bikes. The options for hitch mounted rakes are: hanging or platform hitch mounted racks. When considering a hitch rack, it is important to know the size of your vehicle’s hitch as most of these racks fit standard hitches that are one and a quarter to two inches in diameter. If you need an inexpensive way to take the family’s bicycles on vacation, then a hanging hitch mount rack may be a good option. Bicycle frames hang from padded bars that are attached to the hitch of a vehicle. These racks are made to be easy to install and remove, so you should be able to mount it yourself. When mounting a bicycle onto a hanging hitch mount Swagman bike rack, you don’t need to worry about scratching the paint of your car or truck. Hitch mounts are designed to keep the bikes away from the back of a vehicle, so there is less chance of damage. While they will hold most lightweight bicycles, including kids’ bikes, mountain bikes, or racing style models, hitch mounts are not a good choice for heavier frames, such as carbon fiber frames. Most hitch mounts allow for 35 pounds per bike. You can find an Amazon bike rack in this style that carries as many as five bicycles. There are many options for bicycle racks for SUVs or pickups, including platform hitch mount racks. Some of these models are made to carry up to four bikes on the back of a truck on a tray or wheel-holder platform. They also carry almost any type of bike, including some recumbent bicycles. Platform hitch racks sit lower to the ground than hanging hitch racks, so it is easier to load bikes onto them. They can carry heavier bikes because they are made from sturdier, heavier materials. Most platform racks have enough space to provide some separation between the bike, so there is less chance they will be damaged. 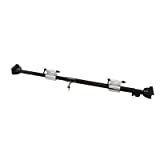 These racks are designed for vehicles designed to tow trailers, boats, or other cargo with a receiver hitch. Most receiver hitches are bolted to the bumper of the vehicle and have a square receiving tube into which the tow rack is attached. A tow rack can carry up to four bicycles, depending on the weight per bike. Like hanging mount hitches, many towing racks are not meant for heavy frames, but for lightweight adult bikes and children’s bicycles. Most towing racks are designed to hang bikes from the rack, but there are a few models, such as one of the Swagman towing racks, that allows bikes to be mounted by placing the wheels in holders. However, the bike is still hanging from the main part of the rack, so a weight limit of 35 lbs. per bike is recommended. 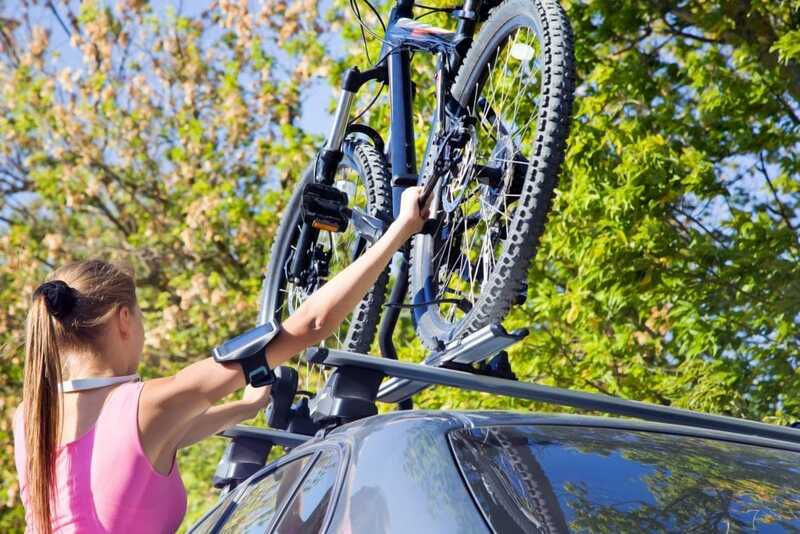 If you don’t have a pickup or SUV, you can still transport your bikes on vacation or to off-road trails by installing a trunk rack on your car. Trunk racks are the most common racks used for vehicles, and they are also the least expensive. They can be mounted to a wide variety of car models, including those with hatchbacks. Trunk mounted racks are easy to install and remove, so when you’re not carrying a bike, they can be put into your garage, shed, or the trunk of your car. Also, they can be moved from one vehicle to another with few adjustments. Most trunk racks will carry one to three bicycles. Since there are several places that the rack touches your vehicle, you should be careful when installing the rack every time you use it. However, once mounted, most racks have a separation between the bike and car, so the car nor the bike should sustain scratches or other damage. If your RV doesn’t have a hitch receiver or bumper, then a ladder mount rack can hold one or two lightweight bikes. This rack may be a good choice if you’re only taking kids’ bikes on your trip. RVs with steel, welded bumpers can easily carry one to four bicycles on most bumper mount racks. However, if the bumper isn’t welded to the RV, they may not be able to hold a rack and your bikes due to the weight of the bikes. A hitch mounted rack attaches to an RV with a receiver hitch and can carry up to four bikes. They are available in both platform and hanging rack styles. The hitch mount can be transferred to many other vehicles if you don’t want to drive your RV whenever you want to take a bike with you. If you and your family enjoy cycling, you should consider choosing a Swagman bike rack for taking your bicycles to the lake, on camping trips or to the nearest bike trails.